Close to 90 people attended an old fashioned holiday picnic on June 30, 2018 to honor Congressman Joe Courtney at the beautiful home of Alison Mitchell on the Lieutenant River. Special thanks to ​the Tri-Town DTC's of Old Lyme, Old Saybrook and Lyme for coordinating this event. ​A shout out to Democratic candidates Matt Pugliese, Martha Marx, and Norm Needleman for attending, and to the Masters of Ceremonies, Bonnie Reemsnyder, First Selectwoman of Old Lyme, and John Kiker, Selectman of Lyme. The Old Lyme DTC at The Blue Wave Fest in Chester. The Lymes' Senior Center was the place to be for Doo-Wop Music and Ice Cream on July 12th. The Old Lyme DTC sponsored the ice cream social. Peter Cable, Kathy Murphy, Martha Marx, Chair of The New London DTC, and Roger Nosal (checking out the selection). Bonnie Reemsnyder and Michele Hayes at your service! 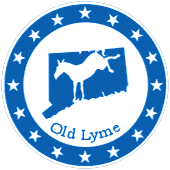 ​Please join us at the next regular meeting of the Old Lyme DTC.